1775: Continental Marines, later to be known as the U.S Marine Corps, is founded. During the American Revolutionary War, future President John Adams drafted a resolution for two Battalions of Marines to be raised, which was passed by the Continental Congress on this date. Under the leadership of Captain Samuel Nicholas, the two battalions of Continental Marines were formed as a naval infantry in Philadelphia. They carried out a number of important amphibious operations until 1783, when American independence was won. The Continental Navy along with their branch of marines was disbanded thereafter. It wasn’t until the U.S Navy was formally re-established in 1798, and when John Adams was made President, that Adams signed another bill to make the U.S Marine Corps a permanent branch of the U.S Navy. 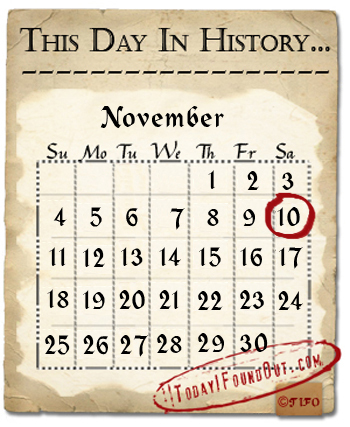 However, November 10th, 1775 is still observed as the birth date of the Marine Corps. 1903: Mary Anderson was granted a patent for her car window cleaning device- the windshield wiper. Born in Greene County, Alabama, Mary ran a cattle ranch and vineyard in Fresno, California. She thought up making such a device after traveling to New York one winter and noticing the hardship drivers faced trying to see out of the front window when it rained or snowed. She returned to Alabama and hired a designer to help her draw up an idea she had, a swinging arm attached with a rubber blade that was controlled by a lever inside the car. She then had a working model made by a local company and applied for a patent for her device. On November 10, 1903, she was granted a patent (number 743,801). She tried to interest a Canadian firm to produce the device, but to no avail. Unfortunately, this was the only record of her trying to market her invention. Her patent expired, just before her design for windshield wipers became standard on most vehicles in America. 1969: A TV Show targeted towards preschoolers “Sesame Street” aired its first episode on the National Educational Television Channel in the United States. Conceptualized by former documentary producer, Joan Ganz Cooney, Sesame Street is a TV show designed to teach children the alphabet and how to count, in new and entertaining ways. The show’s short segments are hosted by colorful puppets (known as Muppets) and they featured live actors along with informative animated clips. The show became a huge success and went on to become the most widely viewed children’s program in the world, airing in 120 countries since its start. 2001: George Bush Jr. pledges to take on a fight against terrorism in an address to the United Nations. Following the September 11, 2001 terror attacks on the World Trade Center in New York and the Pentagon in Washington, DC, President Bush took a stand against terrorism and appealed to the United Nations for help. In his statement, Bush attempted to define the war on terrorism, a global responsibility which all countries must take action against and not just talk about. He tried to tug at the heart strings of those present by saying, “A few miles from here, many thousands still lie in a tomb of rubble”, referring to the proximity of the United Nations headquarters in New York City to the World Trade Center towers that had fallen during the attack. Bush proposed U.S.-led military action in Afghanistan against al-Qaeda and the Taliban regime that had sponsored them, along with any nations that harbor terrorists or aid them in any way. The President’s speech was hard-hitting and frank, calling upon preemptive action from other nations against terrorism, stating that “The cost of inaction is far greater. The only alternative to victory is a nightmare world where every city is a potential killing field.” Two years later, lamented by some, applauded by others, Bush made good on his statements by sending American troops to Iraq to overthrow the dictator Saddam Hussein, whom he accused of developing weapons of mass destruction and funding terrorism.